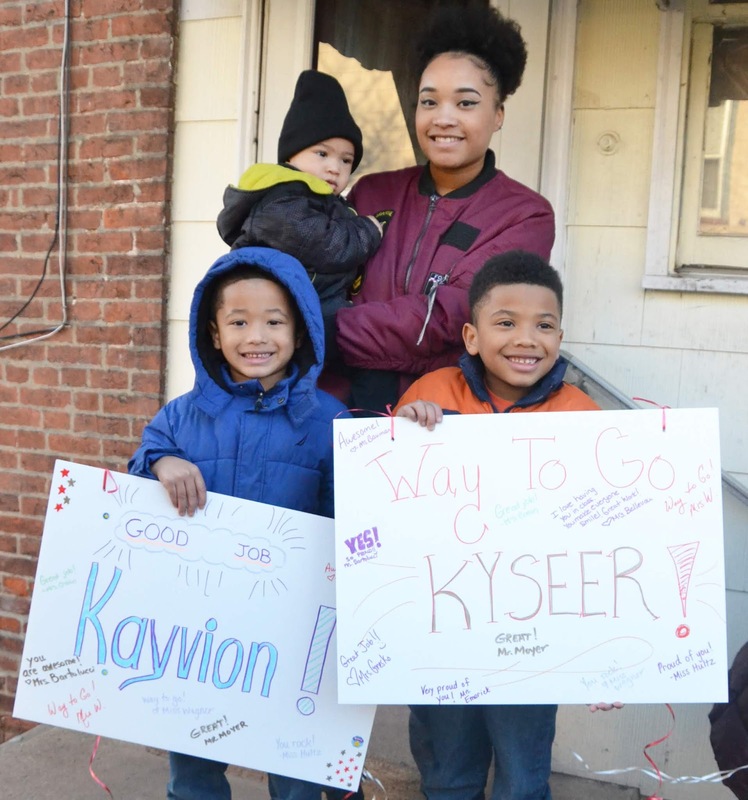 For the first time, two siblings, Kayvion and Kyseer Reinert-Cotton, above, were both recognized by Rupert Elementary School's I'MPCAT Team for accomplishments during the second semester. Kayvion is in kindergarten and Kyseer is in first grade. At right, third grade award winner Peyton Coale looks pretty surprised (and pretty happy) to see Rupert Elementary Principal Matthew Moyer knocking on his door. Photos Courtesy of the Pottstown School District. Blogger's Note: The following was provided by Rupert Elementary School. 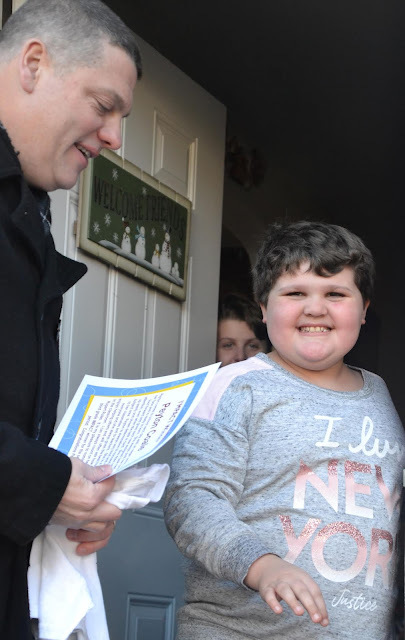 The Rupert Elementary School I’MPACT team visited the homes of its students on Monday, Jan. 28. The team went out to visit student from each grade level to congratulate them and their families, and to acknowledge student successes during the second marking period. by Rupert teacher Allen Ferster. I’MPACT is an acronym for I’m Pottstown Action Community Team. Its mission is to “Celebrate Learning” with positive communication of activities happening at school through the building of relationships with community members. 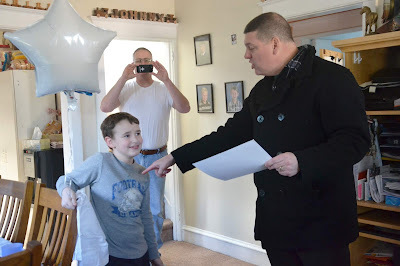 The team makes door-to-door visits to surprise students and their families with certificates of achievement, yard signs, balloons, and I’MPACT Winner shirts. 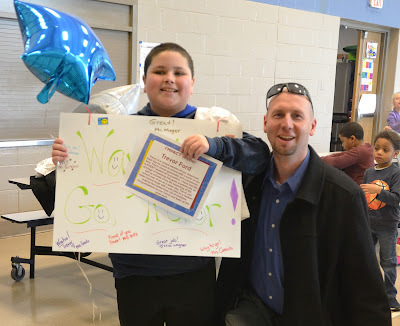 Students were congratulated for their hard work, citizenship, and positive behavior. The I’MPACT Team consists of teachers, support staff, parents, and administrators from Rupert Elementary School. seem to know what to make of a visit from the principal. But dad does, grab the camera! For the first time ever the team recognized siblings. Kyseer and Kayvion are brothers and were both individually selected by their respective grade levels! Principal: Matthew Moyer and staff: Kerry Kline, Laurie Gresko, Cindy Bartolucci, Stacey Bauman, Kelsey Hultz, Ashley Bellevou, Cheryl Wambold, Lauren Crean, Allen Ferster, Diana Dotterer, Kalena Pippert. 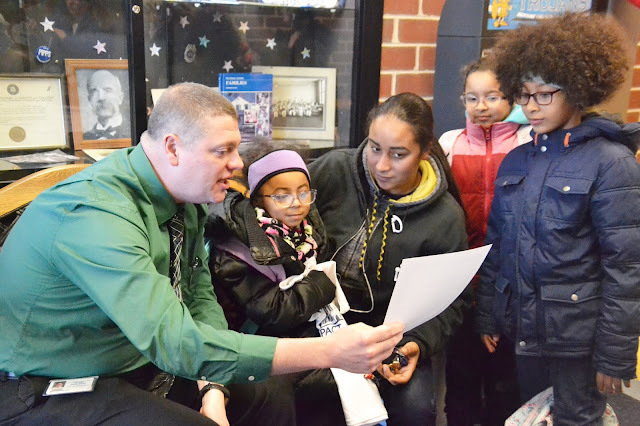 Rupert pre-kindergartner Faith Smith, second from left, enjoys having her I'MPACT Award read to her by Rupert Elementary Principal Matthew Moyer.